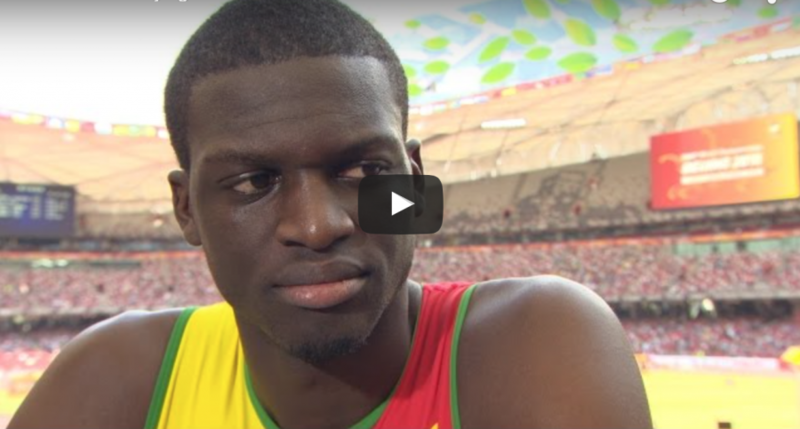 Kirani James, Isaac Makwala and Wayde Van Niekerk led the way into the men’s 400m final on Wednesday night after winning Monday night’s three semi-finals. Defending champion La Shawn Merritt is also through, finishing just behind Van Niekerk in the third and final semi in an easy-looking season’s best. After the high noon shoot-out on a hot track in Sunday morning’s heats, it was hard to know what to expect. The draw had already thrown up one surprise, with the two sub-44-second men from the heats, Yousef Masrahi and Rusheen McDonald, both drawn in the second of the three semis. With only two to go through automatically from each of the three semis, if heat form held up, that would leave the rest – including African record-holder (at 43.72 this year) Isaac Makwala – running for the fastest non-automatic spots in the final. At least one man who had run a recent sub-44 was not guaranteed a place in the final. Olympic champion James won the first semi-final in 44.16, edging away from Luguelin Santos over the last 20 metres. Santos ran 44.26, both men improving substantially from their heat runs. US champion David Verburg was third in 44.71 and Kevin Borlee fourth in 44.74, with both having to wait for the other semis to see if they could advance to Wednesday night’s final. By the time the second semi was run, their chance had vanished. Makwala, drawn in the outside lane, led the second semi-final all the way round to win in 44.11. Masrahi took the second place in 44.40 and Rabah Yousif of Great Britain advanced as one of the fastest non-automatic qualifiers with a personal best of 44.54 in third. McDonald was sixth in 44.86, which was not good enough to advance. Olympic bronze medallist Lalonde Gordon, fourth in 44.70, also missed out in this semi. Van Niekerk, Merritt and world junior champion Machel Cedenio looked the cream of the third semi. Van Niekerk, drawn one lane outside Merritt, started fast with the defending champion getting a nice carry through. Cedenio started to move through along the final straight, as he had done in the heats, but he could get no higher than third as Van Niekerk crossed the line in 44.31, ahead of a relaxed-looking Merritt, who ran a season’s best of 44.34, and Cedenio, who took the second of the two non-automatic spots in third with 44.64.